Ask yourself how often you think about your garage door? If you are like most other people that have a garage door when you are using it you have a lot on your mind. You open the door to leave the house usually in a hurry to get somewhere or for some other task like mowing the lawn, taking out the trash, washing the car etc. Unless you are trying to improve the curb appeal of your home by replacing your garage door you will only think about it if it falls down, stops working, or makes a lot of noise. The fee to have the door serviced is easily justified when compared to the inconvenience of having your car trapped inside your garage because your door failed to open. The calls we get here at Hung Right Doors are usually from someone in a panic because they can’t get there car out to go to work, take their kids to school, or some other important event that they need to get to NOW. We had one yesterday from a person in Tumwater. We can usually get to their house the same day they call and fix it but unless you leave for your appointments early every time just in case your garage door does not open you will still be inconvenienced. The broken garage door problem gets even worse if it’s after hours or on the weekend. Companies that have 24 hour service usually charge a higher rate for emergency service. A customer told me she paid 3 times the normal service rate for a after hours garage door service repair in Olympia WA. In some cases when you are done paying for an after hours or emergency service call you could have purchased a new door for the same price. When you have your door serviced annually the person that comes out should check the garage door and all of its components including the garage door opener. 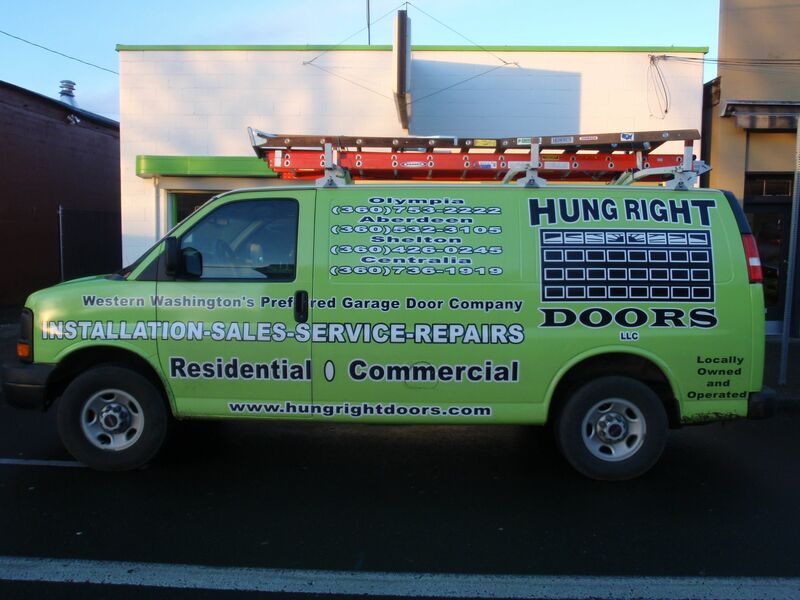 When you call Hung Right Doors one of our technicians will come out the same day in most cases and give you a free estimate. If you agree to have the work done for the price you are given our fully stocked trucks almost always have all parts needed to get the job completed immediately. We start by inspecting the door while it is disconnected from the opener. Once the opener is disconnected we can make sure the door is balanced so that if the opener fails you can unhook it from the door and open & close the door by hand until you have it repaired. After we have completely gone over the door we go through the opener to check it out. The next step is connecting the door back up to the opener and doing a safety check of the reversing system. Once the service is finished, our technician will have inspected all the parts of the door and opener, adjusted the track and springs, lubed all the components and completed the safety check. We can teach you how to lubricate the door & opener yourself. We can also teach you how to check a few basic functions of the door and opener. With these basics you can increase your time between services by doing it yourself. We still recommend a professional do any adjustments to the springs or any other part of the door. There have been a number of serious injuries and even deaths from garage doors. Your garage door is the largest mechanical object in your home. Not maintaining your door is similar to not changing the oil in you car or replacing the tires when they are worn sooner or later it will fail. Maintaining your door greatly decreases the chance that you will have any issues at an inopportune time leaving you helpless.